The Maharashtra Cricket Association (MCA) Stadium is located in Gahunje, Pune (Maharastra). It is also known as Gahunje Cricket Stadium. The cricket stadium is also known as Pune Cricket Stadium. The stadium is owned by Maharashtra Cricket Association. In 2013, the Sahara India Parivar bought the naming rights of the stadium for the sum of 200 Cr Rs and the Stadium was named to Subrata Roy Sahara Stadium. But the company didn’t pay the full amount so the name of the cricket stadium was changed back to Maharashtra Cricket Association Stadium. The first match which was played on the stadium was between Kings XI Punjab and Pune Warriors in April, 2012 and it was an IPL match. In December, 2012 first international T20 match was hosted on this stadium which was a clash between India and England. The only ODI which was played on this stadium was between India v Australia in Oct 13, 2013. The Pune cricket stadium has a seating capacity of 42,000. The stadium is home ground of Maharashtra cricket team, Indian Cricket Team, Veer Marathi and IPL team Rising Pune Supergiants (RPS). During the IPL 2018, Chennai Super Kings matches were shifted to this stadium due to controversies in Chepauk stadium of Chennai. After the successful hosting of Indian Premier League matches no international match played here. After a gap of around 5 months, this stadium is ready to host India vs WI 3rd ODI on 27 October 2018. West Indies will play 5 ODI series against India during their 40+ days India tour. Pune MCA stadium is always ready for big matches like that and preparations for the India WI ODI has already started. West Indies is a good team with good batsmen and bowlers. India ia also prepared to handle the West Indies team in sporting way. India WI MCA stadium tickets are in high demand after the declaration of this stadium as venue for IND vs WI 3rd ODI. Ticket for Pune stadium are generally sold through online mode and we are expecting that tickets for India West Indies third ODI will start couple of weeks before the game. Pune Sahara stadium ticket prices are generally divided in multiple categories to attract all budget people. MCA Ticket rates and tickets are not announced by organizing committee till now and we are expecting that prices will be pocket friendly. As per guess and last matches average India WI 3rd ODI tickets rate should start from 800 to 1000 Rs and they many price categories will be made to target all type of fans. All details of India WI Pune match tickets will be shared here after the official announcement. Log on to authorized IPL tickets booking website and select city to Pune. Now looking for sports category and look for IPL tikcets. In IPL tickets look for the desired match and click on book now button. Choose seats from available tickets as per your budget. After selecting the tickets payment is required in digital format. E tickets need to be exchanged with physical tickets which are mandatory for entry in Gahunje Stadium Pune. I hope this information is sufficient to book Pune stadium Eliminator and Qualifier 2 IPL 2018 tickets. Here are few steps for booking Pune Cricket Stadium IPL 2017 tickets online at any time of day. Select the match, date, price and ticket quantity from stadium layout. Now select the seat from the seating layout. After making the payment, tickets would be delivered to your mailing address or you can also collect the tickets from the box office. Ticket prices for IPL 2017 were started from 800 Rs and goes up to 4000. Will be intimated via email / sms to ticket holders. This Google map showing the location of Pune cricket stadium. 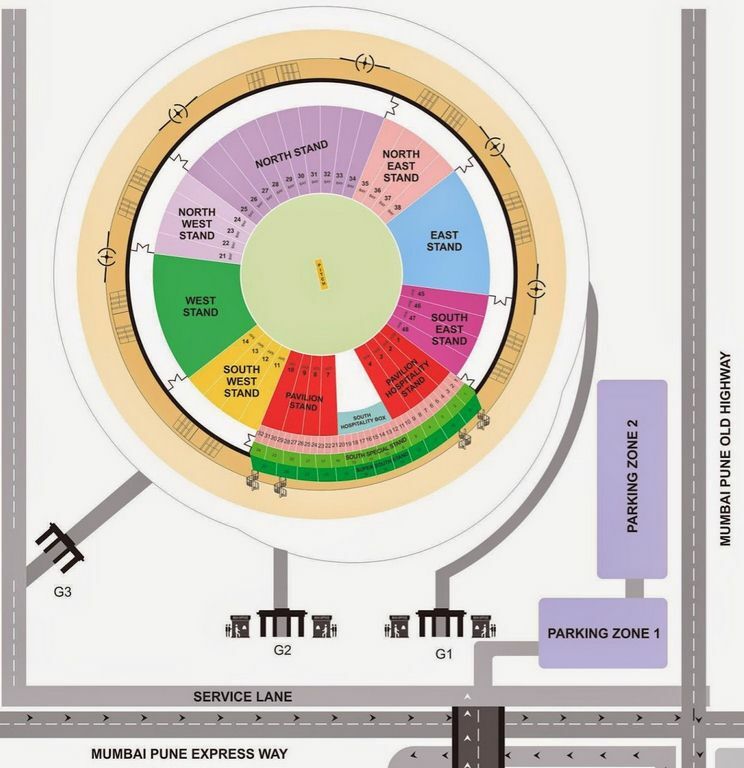 The Pune cricket stadium seating arrangement is shown below. It shows various roads and stands which makes it easier to choose which stand to book and which road to take while visiting the stadium. Parking zones, pavilions, stands, service lane also depicted on the map clearly. It is located in Mumbai Pune Expressway just in the outskirts of the city. You can clearly see the old and new highway on the layout. To have a good overall experience and to be ready for the match, there are few things to keep in mind. On receiving your entry passes, check the gate number which is printed on them. You have to head towards the gate number to enter the Maharashtra Cricket Association stadium and reach to your stands. There are few only a few numbers of items which are permitted inside the stadium. It is advised not to bring any item other than the wallet and mobile phones, as the list of restricted items is rather long. I may name few of the restricted items: water bottles, data cable, power bank, charger, headphones, coins, metal objects, binoculars, plastic bags, eatables or drinkable, etc. Although, some of the baby food items and baby diapers are allowed. If something gets detained at the entry gates, the probability that you would get it back is really low. The entry gates of the stadium generally open 3 hours prior to the start of the match. So, it is good to enter the stadium before time. Pune Cricket stadium has all the basic facilities. There is a cafeteria located inside the stadium which serves good food. The number of washrooms available are also enough. Stadium is in very good condition as it is newly constructed. The stadium seating is constructed in such a was that every spectator experiences a clear view of the stadium. The spectators are seated in four various stands. It has some of the premium facilities for 5,000 members which include squash and badminton courts. It has a spa, swimming pool, restaurants, and bars. It has 80 corporate hospitality boxes too. The stadium is newly constructed and it has a huge seating area. While designing the seating area, the priority was to provide a clear view of the ground to the various stands. The architects(Hopkins Architects) succeed in doing so. The rain is a big problem in Pune and it has caused many matches to be abandoned, so to overcome this problem sand based outfields are developed. These outfield doesn’t allow water to stay on the filed and as a result stadium gets ready to play again in few minutes after the downpour. The stadium is well equipped with all the latest and basic facilities. The ambiance created here is also magnificent on match days when the ground is full with fans. The experience is rather special. It is advised to visit the cricket stadium by public transport as it faces a lot of rush on match days and bringing your own vehicle can become a headache later on. Is ticket required for a 4 year old kid? Let me know is there facility to collect tickets in stadium box office on same day (29th Apr) because I unable to come in pune city. And I have booked online ticket of 29th April 2017 Pune Vs Royal Challengers 4pm match . So kindly confirm the facility of ticket collecting in stadium box office or any option? Hi, how is the car parking facility at the Stadium? I have booked the Rs. 4,000/- ticket for South Pavillion B. The ticket talks about Main Gate 3. Please do let me know. Many thanks.